There are only a few days left in which to view this month's free game On the Beat at playwithsound.com. Every month I post a different game on my website and this one is a good introduction to rhythm. It is also a good test of how alert and able your group is feeling at any given time. It's a good opener for a workshop as it can be used as a name learning exercise. But you could also try playing it later in a session to see if it has a different quality. It's been a busy time, what with playing in the pit band for the Threepenny Opera – rehearsals, dress rehearsals and then six shows in five days, each show over three hours long. Great fun and more on that experience later. But on Saturday I headed off to Cambridge to play for a very different show called Claytime, presented by Indefinite Articles. Aimed at children aged between three and six, but watched and thoroughly enjoyed by older children and adults too, it combines physical theatre, puppetry and audience participation. For this show I play clarinet while the audience assembles and settles; nothing in particular but fairly happy and lyrical in a major key. When the show begins I tend to use items from my treasured collection of odd and unusual instruments for spot sounds and moods. The two actors relate to each other and learn to negotiate in the manner of very young children. I've seen the show once and played for it three times but still find it very funny and entirely believable, a response shared by the all the audience, young and old. This part of the show involves playing with clay and getting increasingly covered in the stuff. When water is introduced it gets very messy indeed. But this allows very fine modelling. "We can make anything! What shall we make?" News! 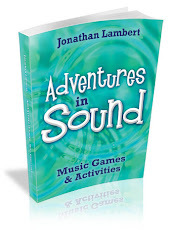 I am running a music games workshop called Games With Sound in Norwich on March 1st. For more details go to www.playwithsound.com and download the information document. There is a 10% discount if you book before the end of January. Last night was the first performance of The threepenny Opera at Norwich Playhouse and, having been engaged as a clarinettist (and later, “by the way, could you bring your tenor along too?”) I’m playing tenor sax and flute in the pit band. The show, with music by Kurt Weill and words by Bertolt Brecht, is immensely enjoyable. The only downside was freezing half to death in the dress rehearsal on Monday night. ‘It will be warmer tomorrow evening with an audience’ I thought. But when Tuesday arrived I regretted my optimism. Although plenty of people came along to watch, the temperature seemed to drop steadily over the course of the evening. I shall wrap up warm tonight. 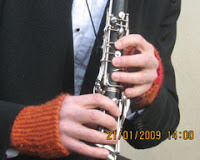 As I sat in the kitchen this morning, mending the leather gloves that make cycling a viable means of transport in the Norfolk winter, I remembered that the clarinettist/alto saxophonist to my left had put on a pair of fingerless gloves during the interval but confided that she had never tried to play in them before. As a veteran of playing outdoors I suggested that the problem of playing in fingerless gloves is this: when you make the hand shape required to play, the material at the palm of the glove bunches up and collides with the keys. For string players the problem is similar, the only difference being that the gloves tend to deaden the strings. With a larger saxophone performance is possible but a little clumsy. Playing klezmer clarinet in the things is a non-starter. The solution came when my daughter, who is handy with a pair of knitting needles, decided to make herself a pair of hand-warmers. When I saw them I immediately put in a request for a pair in my size. I was sent off to the market for wool and the appropriate needles and then waited (and waited and waited). Finally the moment came and I've never looked back. No more the Hobson's choice between rapidly stiffening fingers and the unintentional pressing of the wrong keys at outdoor gigs. The gloves are basically a sleeve of wool with a hole for the thumb at one end. They keep the wrists and the backs of the hands warm without creating awkward folds of material in the palm area. They work a treat and I'll be taking them to the show tonight (along with my thermals). For a show based on The Beggar's Opera they are just the thing. Do you enjoy listening or performing in unusual venues? I've always been drawn to them. They bring their own challenges of course. Access, space, light and power for a start. And then acoustics and audience sight lines. A few Fridays ago I played in a mud building based on an Iron Age round house, deep in the Norfolk countryside. And when I say deep I'm not just using a cliché; the mud promised to be deep and sticky and it didn't disappoint. And, usually for a venue, there is no outside light. So, a dark, muddy access. But the space inside is lovely with a wood burning stove that throws out a good heat. 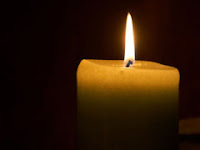 And there is no electricity – just candle light – and I just love that. The acoustic is warm and only slightly reverberant on account of wooden dance floor. The musicians stand on the stone flags by the wood burning stove and, while the dancers learn the steps for the next dance, they attend to the mulled wine. So that just leaves sight lines. I feel I've used the word 'unusual' a little often but, except for a pit band at the theatre, how often are the musicians placed at a level below the dance floor? On this occasion the audience is there to dance, not to watch the band. Circle dancing to be precise. And I just love playing for dancers, too. In parts of the world, and most commonly in parts of Africa, drums are used for communication between villages. The signals mimic the speech of the people sending them and there is no universal drum language. Messages tend to be formulaic and dependent on context making it impossible to tackle new subject matter 'on the fly'. In the industrialized world this kind of communication was common on the battlefield until it was superseded by telephony and radio communications at the beginning of the twentieth century. The disadvantages of using audible signals in battle included broadcasting your orders and intentions to your enemies and losing the message altogether in the din of the battle. This latter problem must have been exacerbated by the arrival of gunpowder. The alternative was to send a messenger but these could be intercepted or suffer a misadventure en route. But from the 1480s onwards a means was devised of transmitting messages over large distances quickly, accurately and privately. This system was named after its American deviser, Samuel Morse, and it is Morse code that we will be using for this exercise. You will need two instruments, each capable of delivering a long sound and a short sound. If you're stuck in this regard then two sticks, one with horizontal grooves cut into it a frequent intervals along its length, will serve as one instrument. Scraping the un-grooved stick along the length of the grooved stick produces a long sound and by tapping the sticks together you have your short sound. If you want to transmit signals over a larger distance then obviously you'll need something louder. Drums are ideal for this as hitting the middle of the skin produces a longer sound than hitting the rim. Wind instruments are also fine candidates. You will also need a copy of the code for each team (or telegraph station) and something to write with and on. Wikipedia has a clear Morse Code chart. Divide your group into pairs of teams. Decide which team will signal first. If need be, provide them with a short message but don't let the receiving team hear. Once the other team has decoded the message they can send a reply. Adults and able children will quickly get the hang of this and establish a conversation. Tips: Morse code's long pulse/short pulse system arose because it was the easiest way to make two different signals with the materials at hand. It is a very effective way of using rhythm to communicate. However, there is no reason why you shouldn't use pitch or different timbres to communicate the code providing you establish which sound is being used for dit (the dot) and which for dah (the dash). Start at low volume over short distances. Save the attempts to communicate across larger distances until you and your fellows have gained some proficiency. Keep the messages very short to begin with and leave clear gaps between letters. Teams of two work well: one to send the signal and the other to write down and decode incoming messages. More than one pair of teams communicating will be a challenge but not necessarily insurmountable. Players will need to recognise the sounds they are being sent amidst all the extraneous noise and perhaps, in so doing, they will develop a respect for those battlefield communicators of the past. Practising scales and technique. A waste of your time? I confess to being a terrible student when I was a teenager. And among the things I hated most were practising scales, arpeggios and finger exercises. I could never see the point and somehow the assurance that it would make the boring classical music I was forced to play easier to execute gave scant solace. As an improvising musician, in both jazz and non-jazz contexts, I usually need to know what sound I am going to make next. I am not belittling the use of chance and surprise both in improvisation and as a compositional tool. But if I am trying to support the actions of an actor, who is in turn responding to a live audience, then I need to know exactly how to create the sound I want. And this is where knowing my instrument becomes so important. And, fortunately or otherwise, one of the best ways to get to know an instrument is by practising scales and technical exercises. However, beware believing them an end in themselves. Jazz, Delicious Hot, Disgusting Cold is the apt title of a song by The Bonzos. When playing a jazz solo, nothing disappoints me more than lifelessly running up and down perfectly executed scales. It's bland, lifeless and says, 'Hey! Listen to me, I have absolutely nothing to say!' It's jazz, disgusting cold. A great jazz solo is made by an inspired blend of imagination and technique. A wide vocabulary alone doesn't make an author but it can help to express meaning with accuracy. Similarly, mastery of an instrument doesn't guarantee a compelling performance but it does allow the performer to play whatever comes into their head. Not for nothing did John Coltrane practise constantly back-stage. You may not like what he played but you have to admire him for striving to express himself with integrity. I find it far easier to convince my jazz students of the value of scales and arpeggios than I do my classical students. This probably says more about me than either group. But improvisation is composition on the fly and to compose you really need to know the instrument for which you write. Even at the most basic jam session, the better we know our instruments the happier we feel about the music we make. What would music sound like in a post-carbon world? As I write, gas supplies to the UK are under threat while we enjoy some of the coldest weather for some years. As well as being burned for heat, gas is used to generate electricity. With oil prices erratic and coal almost a thing of the past our reliance on fossil fuels can appear a little short-sighted. Nuclear power is problematic for a whole raft of reasons and alternatives still make a up a tiny proportion of the total power generated. I rely heavily on electricity in my music work. I use play-along CDs and programs such as Band-in-a-Box and Cubase for my teaching. For composition and soundtrack production I am totally dependent on my computer. And then there is my treasured collection of CDs and LPs. Somewhere my brother has a wind-up gramophone and a collection of 78s. It may be possible to adapt it to the needs of my own vinyl but I can't see it handling mp3s very well. So, if the power is switched off, what then? Well, assuming we don't all freeze in the first cold snap, we'd have to dust off all those acoustic instruments. If you have a piano it's value will suddenly rise and your popularity with it. My guess is that we'll face an enormous skill shortage. In a nation that loves karaoke shows such as The X Factor and Britain's Got Talent, one band can serve the needs of a nation on its own. Where will we go for entertainment once the TV stops working? Which brings me neatly to my book, Adventures in Sound, which will still work in a post-carbon world. None of the games requires electricity or items manufactured in a carbon-based economy. And, by fostering co-operation and music making amongst the participants, it may go some way to solving the skill shortage alluded to above. I was prompted to obtain a copy of the music test when my barber told me that, much to his surprise, his own daughter had been considered 'musical' and was to learn the viola at the school. Obviously the test had survived the change of music teacher. The test is divided into four sections; pitch, tunes, chords and rhythm. Instructions are given, questions asked and then a tape is played and the children write their answers. Now call me thorough but these exercises need to be practised for the concepts to be understood. The instruction to the test administrator is 'Pause and check children understand'. My suspicion is that very few seven or eight year olds understood. In fact they understood so little that they couldn't even begin to explain. The silence around them just made them feel they were alone in not understanding. The answers are 'multiple choice' meaning you have a reasonable chance of success depending regardless of ability. It also means that the person marking the results has no real clue as to whether or not the question was understood. With Christmas crackers a recent memory you've probably had enough of bad jokes. Please indulge me anyway: the kids that supposedly can't tell a high pitch from a low one, can't tell one tune from another and can't distinguish between two different rhythms, what happens to them? I'll tell you what happens to them. They get to join the school choir! Ho! Ho! Ho!